The map data depict areas of steep slopes where landslides may begin. The map data do not depict the where material from landslides or debris flows will travel and deposit. The map data are classified into susceptibility categories of "very-high", "high", and "moderate". The categories indicate the relative potential for landslide initiation and are based on expert judgement and a simple slope-stability model applied to digital topography following the methods of Harp and others (2009). The digital topography has a resolution of 10 m or 33 ft. Included in the map data are a vector data set of stream channels from the National Hydrography Dataset. These "watch streams" indicate some of the possible paths debris flows, other landslides, or flash flooding may travel. Landslides and flows of water and debris may extend laterally beyond the watch streams as they travel and encounter roads, culverts, and other infrastructure not depicted in the digital topography. The susceptibility and watch stream map data have not been tested or calibrated to past events. This information is preliminary or provisional and is subject to revision. It is being provided to meet the need for timely best science. The information is provided on the condition that neither the USGS nor the U.S. Government shall be held liable for any damages resulting from the authorized or unauthorized use of the information. FOS_HI_Islands_Lane.shp – showing Factor of Safety for the Hawaiian Islands. Use the LS_sus field to show the different classes of landslide susceptibility (Very High, High, Moderate). This is a red, orange, yellow style with no outline color. Metadata for FOS_HI_Islands_Lane is also included. Harp, E.L.; Reid, M.E. ; McKenna, J.P.; Michael, J.A. Mapping of hazard from rainfall-triggered landslides in developing countries: Examples from Honduras and Micronesia; 2009; Article; Journal; Engineering Geology; Harp, E. L.; Reid, M. E.; McKenna, J. P.; Michael, J. 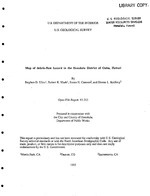 A.
Ellen, Stephen D.; Mark, Robert K.; Cannon, Susan H.; Knifong, Donna L.
Map of debris-flow hazard in the Honolulu District of Oahu, Hawaii; 1993; OFR; 93-213; Ellen, Stephen D.; Mark, Robert K.; Cannon, Susan H.; Knifong, Donna L.